'Super Venus' in another solar system is not habitable, so why did the media say it was? The journal article, published by a team led by Robert Wittenmyer from the University of New South Wales in Australia, described a world boiling under its own stifling cloud cover. With an orbit that only skirted the region capable of maintaining water, and a mass sufficient to attract a thick atmosphere, the planet was designated a likely "super Venus" and unsuitable for life. Worse still, it was so close to its star that it risked being in a tidal lock, with one side doused in the heat of a perpetual day while its reverse remained shrouded in night. GJ 832c is a planet to inspire thoughts of Dante's Inferno and the facts were clearly laid out in the freely available journal article. How then did the press get it so completely wrong? The answer lies in the use of a quantity denoted as the "Earth Similarity Index" or ESI. It is designed to indicate how "Earth-like" a planet might be. The problem is that the resulting number is a weak comparison between the two objects. It cannot be equated to how suitable the planet may be for supporting life. Accessing the habitability of a world outside our solar system is no easy task. The information planetary scientists have about a planet is limited. They are typically working with only the mass (and sometimes radius) of the planet and the type of star it is orbiting. It is this data that ESI uses, and that is why it is fallacious. The distance at which the planet is orbiting a particular star can be used to define the "Habitable Zone". Coined in 1959 by scientist Su-Shu Huang working at the University of California at Berkeley, the Habitable Zone around a star is the location where water could exist on the surface of a planet, if that planet had a sufficient atmospheric pressure. The caveats here are important: the Habitable Zone does not say there is water present, or that a planet exists that might be able to support life. It only marks out a region where the amount of stellar radiation would not boil nor freeze water. In short, very few planets found in the Habitable Zone of their star will be suitable for life, but if another Earth-like planet existed, it would be there. This makes the region a prime search area for future missions targeted towards habitability. However, it is not its proximity to the edge of the Habitable Zone that kills the deal for GJ 832c. With a measured mass at least five times that of the Earth, GJ 832c is capable of attracting a thick atmosphere. Even if the gas constitution was similar to that on Earth, this would result in a high quantity of greenhouse gases that trap heat reflected from the planet's surface, evaporating all the water, if any existed there. If that is not unpleasant enough, the higher planet mass could result in hydrogen and helium being retained in the planet's atmosphere – which otherwise escape Earth's weak gravity – producing a terrible atmospheric mess from the perspective of humans someday living there. Finally, GJ 832c is very close to its star, with an orbit of only 35.8 days. Since the star is small and relatively cool, the planet is saved from the cooked fate of Mercury, but the gravitational pull is likely to be sufficient to cause a tidal lock, much like our moon is locked with one side permanently facing the Earth. This causes further problems for life to exist. The calculation of the ESI is based on four parameters: mean radius, bulk density, escape velocity and surface temperature. They are manipulated in way that on multiplication the value is between 0.0 and 1.0. Any value above 0.8 is considered a near-Earth match. GJ 832c has an ESI of 0.81. The ESI value holds no water (pun intended). For instance Venus with its estimated temperature would give it an incredible 0.9 match with the Earth. "All conversations regarding habitability are worthless if we ignore the limited data present within our own solar system," Stephen Kane, a planetary scientist from San Francisco State University said. "If we start defining Venusian planets as being habitable then we are no longer doing science." While the mass, radius and temperature certainly have a bearing on the planet's environment, they are overwhelmed by other factors that contribute to the support of life. For example, water is thought to have been delivered to the Earth by ice-rich meteorites scattered inwards by the outer planets during its formation. A different system of planets could bypass this process, allowing Earth's twin to form but be uninhabitable to all known forms of life. Similarly, the Earth's magnetic field protects it from harmful solar radiation, its distance from the sun allows it to rotate hundreds of times per orbit to ensure an even distribution of heat and the sun itself is a quiet star without violent radiation outbursts that could overwhelm the Earth's defences. These are a small fraction of the processes that will determine a planet's suitability for life and none of them are included in the ESI. The upshot of this is that a planet with an ESI of 0.1 is just as likely to support life as one with ESI 0.99. The ESI is neither used nor referred to in scientific publications, but its tantalising one-number answer has caused it to propagate rapidly through the majority of science news sites. The result is articles that are, at best, misleading but, most of the time, just wrong. Perhaps though, the most disappointing fact about the ESI is that it detracts from the real excitement of GJ 832c. With its high mass and thick atmosphere, the planet has been declared a "super Venus", for which the only other example (Kepler 69c) was discovered last year. "Understanding how common they (Venus-like planets) are will help us to decode why the atmosphere of Venus so radically diverged from its sister planet, Earth," Kane explained. The media deceived by an ESI number? What about all the other BS and fads the media pushes? The media is driven to sensationalize by the desire for attention and significance. And in some cases (especially now) by its political agenda. Disclosure: I'm fond of ESI, it is a great tool and Mendez does a good job! But regardless, this is a worthless analysis of Tasker. These types of indexes are filters that helps further study, and the very use of ESI is that it is an inclusive filter. 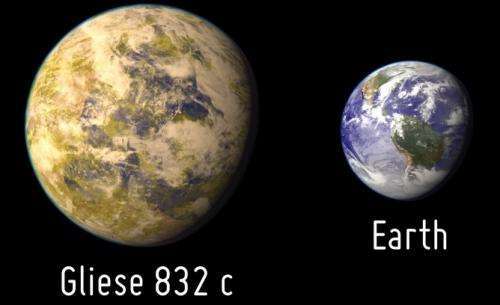 If the planet had been less massive, or even now if it has captured little volatiles, it would be habitable. The problem is if you use a "little people" approach where you say people don't understand the constraints used. The media gave this a better coverage than this article. "the Earth's magnetic field protects it from harmful solar radiation". More drivel. It is Earth's atmosphere that protects it from both UV and the 10 % CR the Sun's vast magnetic field hasn't stopped. Our magnetic field shields our atmosphere from hydrogen loss, so water loss and ultimately preventing a Venus's style greenhouse runaway. "its distance from the sun allows it to rotate hundreds of times per orbit to ensure an even distribution of heat". Venus has an even distribution of heat, despite being near tidal locked. Again, too simplified analysis. "the sun itself is a quiet star without violent radiation outbursts that could overwhelm the Earth's defences." Only young stars has CMEs that can attrition atmosphere, and only 90 % of all stars. Sun is a little less variable than average, but not extremely so. "The upshot of this is that a planet with an ESI of 0.1 is just as likely to support life as one with ESI 0.99." Wrong. The very reason for the ESI is that it can filter out 0 habitability, but it has also a correlation to the center of the HZ. Ergo, higher ESI, higher likelihood of habitability with the given constraints. Tasker's claim is analogous to claiming that a 10 year old is likelier to have a child than an adult. Things are not helped when Phys.org itself publishes articles with graphics (link below) that describe Gliese 832c as "potentially habitable". This just illustrates how the media does so easily get it wrong - this magazine itself can't interpret written publications!